We’re on the countdown to New Zealand Babywearing Week (2-11 October 2015) and we are looking forward to celebrating with you. 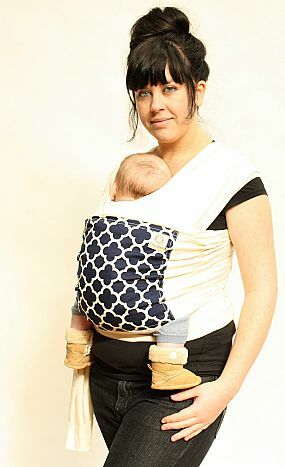 Our next giveaway is a Carry Wrap courtesy of New Zealand Babywearing Week sponsor Nature’s Sway. The New Zealand made Natures Sway Carry Wrap is a supremely soft organic cotton stretchy wrap that will be a beautiful addition to your baby carrier collection. The central panel provides support for baby’s back and doubles as a handy pocket – and they come in a range of colour and pattern options to suit all tastes. For more information on this carrier visit the Nature’s Sway website. Like the Nature’s Sway facebook page and leave a comment to say hi and how you found the page. Leave a comment under this post to let us know why you would like to win this Nature’s Sway Carry Wrap. Good luck to all who enter! A winner will be drawn after 7pm on Thursday 17th September 2015. New Zealand Babywearing Week – the countdown is on . . .